“We’re only in this if we have a majority with us,” said Richard Davey, chief executive of Boston 2024. Pictured: Davey at a Boston City Council meeting earlier this month. The local Olympic bid committee says it will move forward with a proposal to bring the 2024 Summer Games to Boston only if a majority of the public shows support for the effort — and the panel would be open to a statewide referendum to accomplish that. Other parties have already begun the process of placing a question on the city or state ballot, including an attempt by former gubernatorial candidate Evan Falchuk to organize a ballot initiative to bring a question about hosting the Olympics to a statewide vote next year. 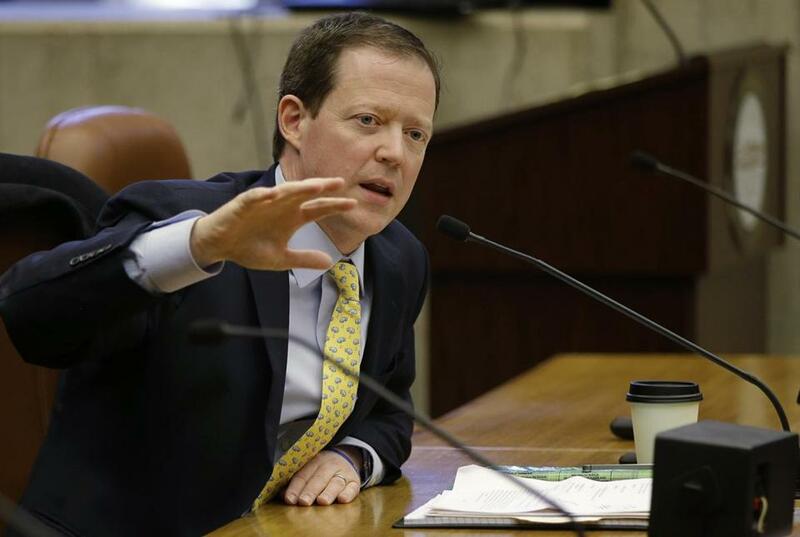 Davey stopped short of directly calling for a referendum, saying the committee is open to how the support would be measured, either with a vote or through public polling closer to the deadline for submitting a bid. “If we do our jobs over the next two years, we will win a majority,” he said. The growing operation includes senior political advisers to Mayor Walsh, Governor Baker, and former Governor Patrick. 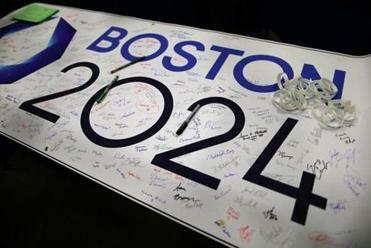 Boston 2024’s pledge to move forward only with majority backing is one of 10 promises the committee outlined Monday in advertisements in the Globe and the Boston Herald. The advertisements are an attempt to reverse a damaging perception that the Olympic bid is flying ahead with the speed of Jamaican sprinter Usain Bolt, regardless of public opinion. It is also an effort to refocus the public conversation about hosting the Olympics after several tough weeks for Boston 2024. The bid committee’s message has been drowned out recently by noisy debate over its plan — now abandoned — to pay former governor Deval Patrick $7,500 a day for occasional travel to promote the bid. “The last couple weeks, we’ve been distracted from our core principles,” Davey acknowledged. Among the commitments that Boston 2024 makes in the ad is a promise that the bid would advance only if the federal government picks up security costs, expected to be $1 billion or more. The committee promises the bid would include “multiple layers of insurance. . . to protect the city and state from financial risk,” a novel concept for Olympic bids that Boston 2024 has not yet presented in detail. To move ahead, the bid must also create jobs and affordable housing and “serve as a catalyst for improvements in public transportation,” the ad pledges. Boston 2024 also will not move forward without a “clear and measurable plan” to include women- and minority-owned businesses, according to the ad. Public polling suggests the committee has a lot of work to do, if bid leaders want to win majority public backing for holding the Games in Boston in 2024. A WBUR poll released last week suggested 36 percent of Boston-area voters support bringing the Summer Games to the city in 2024, while 52 percent oppose it. Such opposition was up six points since February, the survey suggested. The poll of 504 registered voters, conducted March 16-18, had a margin of error of plus or minus 4.9 percentage points. By embracing a possible vote, Boston 2024 is betting the future of the bid on the committee’s ability to prove that the benefits outweigh the potential risks. But if a majority of the public cannot be rallied to support the bid, it would probably not be worth bidding anyway: An Olympic bid needs strong public backing to win a vote of the International Olympic Committee, which will gather in Peru in mid-2017 to choose the 2024 host. The IOC “doesn’t want to send athletes to a place they’re not welcome,” IOC president Thomas Bach told a group of US reporters in January. The IOC takes public support so seriously that it will conduct its own polling in the candidate cities before it selects a host. The bid committee states in its ad that it is looking for a statewide majority, though it acknowledged it must also have a majority within the City of Boston or it would not be possible to go up against an international field that could include Hamburg, Rome, Paris, and Istanbul. Any majority may have to be substantial to impress IOC voters, especially if public enthusiasm is high in competing cities. Recent polling in Hamburg, which is expected to submit a bid, pegged support at 64 percent. The IOC often sees levels of support even higher when evaluating Olympic proposals. The US Olympic Committee, which in January chose Boston over three other US finalists to represent the United States in the worldwide competition, has no objection to putting the bid to a referendum, said Patrick D. Sandusky, USOC chief communications and public affairs officer. Mark Arsenault can be reached at mark.arsenault@globe.com.